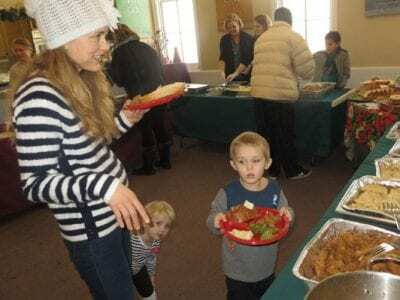 The true meaning of Christmas was experienced Monday in Putnam County when Brewster’s First Baptist Church opened its doors for a special luncheon. Pastor Travis Mitchell described the event as the “community coming together. Christmas is abo… Please login below or purchase a subscription to the Putnam County Courier to access this content. Christmas arrived a few days early for two Putnam lake communities, but officials in both Kent and Patterson were joyous nevertheless. 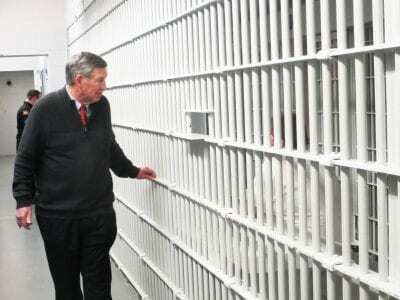 On Friday, Governor Andrew Cuomo unveiled his draft 2018 State of the State that will implement a $65 million four … Please login below or purchase a subscription to the Putnam County Courier to access this content. Putnam residents awakened to a White Christmas Monday thanks to a two to three inch snowfall that blanketed the Hudson Valley. Authorities reported a quiet Christmas-eve and morning allowing Santa to make his rounds unimpeded. Highway crews plowed, s… Please login below or purchase a subscription to the Putnam County Courier to access this content. 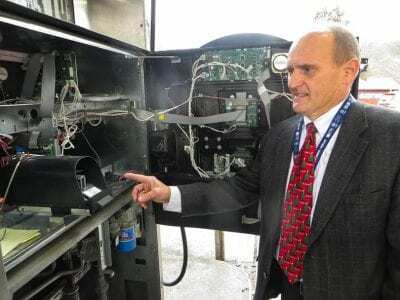 Mike Budzienski checks the interior of a pump in search of illegal scamming devices. Photo by Eric GrossEach of Putnam’s 45 services stations and convenience stores selling gasoline from Cold Spring to Carmel has been visited at least once this year … Please login below or purchase a subscription to the Putnam County Courier to access this content. ‘Positive train control’ could override the engineer in cases where a train is speeding into a curve, potentially saving lives. 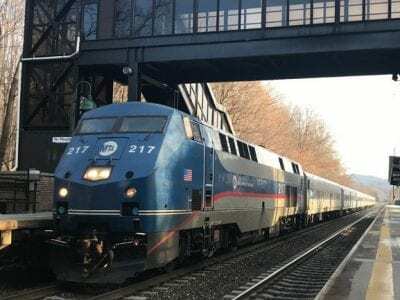 A Metro-North train on the Hudson line is shown here Tuesday in Cold Spring. Photo by Chris Layton The details are eeri… Please login below or purchase a subscription to the Putnam County Courier to access this content. There is nothing more peaceful and spiritual than spending New Year’s morning at the Chuang Yen Monastery in western Kent. The Buddhist Association of the U.S. has invited area residents to a New Year’s morning Interfaith Prayer for World Peace at th… Please login below or purchase a subscription to the Putnam County Courier to access this content.